Which is Better for Mobile App Development: In-House or Outsourcing? Modern mobile technologies churn out complex apps and new hi-speed games regularly, for the benefit of users. From personal use apps to professional inbuilt services; mobile phone companies compete with each other to provide the best features for the end users. People use mobile apps for multiple purposes such as chatting, watching videos, listening to music, enjoying movies, messaging, reading news, reading updates on social platforms, playing games, social networking, checking on sports updates, searching for quality travel services, booking hotel rooms, buying goods and services, selling goods and services, checking on the local weather and many such useful services. There are literally millions of mobile apps for the use of smart phone users on various e-stores and mobile stores. Every mobile app helps users find specific solutions. Users can conveniently download mobile apps that suit their mobile phones and meet their requirements, from any of the reputable online stores. Everything is slowly becoming mobile-attuned. Consider banking for example; nowadays no customer would be interested in opening a bank account that doesn’t offer mobile banking services. From monitoring a marketing campaign to posting a good content for a blog site, everything can be done through a smart phone. There are two sides to mobile app development i.e. in-house or outsource development. Let us evaluate the pros and cons of both, to help you make the correct decision. Companies choosing to go the in-house way with mobile development believe that it is much cheaper, quicker, simpler, efficient and adept. In-house app development can be controlled by the parent company to look after the development operations as per their liking. It brings in transparency in operations during the development process. You can choose for quality developers at affordable prices. It offers total control over the development project. Lots of options are made available while selecting the latest technology. Starting costs are very high, especially to set up infrastructure. Certificates and licenses that are necessary for buying app codes and software tools are obtained after paying exorbitant fee. There is risk of running additional costs, if your developers get stuck mid-way and external consultants have to be roped in. Handing your mobile app development project to a professional mobile app development company is an wise step, if you wish to save considerable time and money and have a superior quality app that truly delivers value. Mobile apps are one of the most commonly and popularly used features in smart phones. Mobile applications also form the centre point focus of tablets. These apps are used by worldwide customers, businessmen, employees, students and general public at large. The final decision is usually based on the cost factor and your chances on risk taking. In today’s technologically advanced world, businesses are always under great pressure to compete with each other and gain a noticeable foothold in the mobile app industry. While most of you would love to maintain the mobile development in-house, it can prove to be a case of static loss factor without the inclusion of outsources in mobile development phase. The ever changing scenario of mobile applications world makes it difficult for mobile developers and companies to decide on a particular development method. 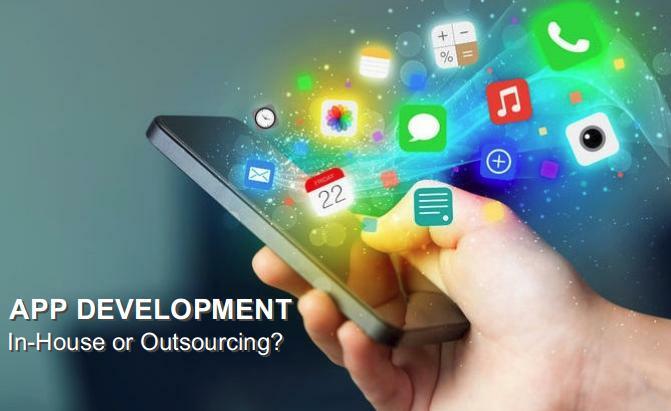 For most companies, it is an evolving journey, wherein they start with outsourcing and later bring their mobile development back to where it belongs- in-house. There are businesses that experiment with both techniques and sometimes settle for a combined package. Some try the do-it-yourself approach, but without trained resources and software tools, it doesn’t get them too far. According to news sources, mobile application developers command high income salary package. Fresh iOS and Android app developers can easily earn a decent salary of $100,000 on a yearly basis. Due to shortage of app developers in the market with such development skills, they are much sought after by multi-national companies.